Monco the web news monitor corpus (which means it is continuously updated) has a tremendous collocation feature. I first saw a reference to the collocation feature from a tweet by Diane Nicholls ‏@lexicoloco but when I tried it the server was acting up. I was reminded to try again by a tweet from Dr. Michael Riccioli ‏@curvedway, whoa it is impressive. For example let’s see what are the collocates of the famous make and do verbs. For make here is screenshot of search settings for collocation (to get to collocation function look under tools menu from main Monco page). Note I am looking for nouns that come after the verb make. Also the double asterisk is a short cut to look for all forms of make (try it without the asterisks and see what you get). How are the words rotate and revolve used? Have a think, then read this description. Now using COCA-BYU’s compare feature let’s see if the description is supported and whether we can add anything to the picture painted by the Grammarist. The description from the Grammarist article that revolve is used with astronomical objects such as planets is supported. We also see the stronger collocations of more abstract nouns used with revolve such as questions and lives. COCA-BYU also supports the Grammarist description that the primary meaning of rotate to mean spin on axis seems to be most frequent. And the Grammarist description could be added to by saying that rotate is used a lot with body parts. 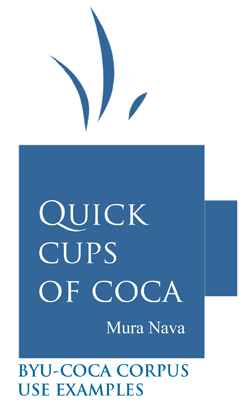 Do sip the other cups of COCA if you have not already. Following on from James Thomas’s Discovering English with SketchEngine and Ivor Timmis’s Corpus Linguistics for ELT: Research & Practice I am delighted to add an interview with Christan Jones and Daniel Waller authors of Corpus Linguistics for Grammar: A guide for research. An added bonus are the open access articles listed at the end of the interview. I am very grateful to Christian (@ELTResearch) and Daniel for taking time to answer my questions. 1. Can you relate some of your background(s)? We’ve both been involved in ELT for over twenty years and we both worked as teachers and trainers abroad for around a decade; Chris in Japan, Thailand and the UK and Daniel in Turkey. We are now both senior lecturers at the University of Central Lancashire (UCLan, Preston, UK), where we’ve been involved in a number of programmes including MA and BA TESOL as well as EAP courses. We both supervise research students and undertake research. Chris’s research is in the areas of spoken language, corpus-informed language teaching and lexis while Daniel focuses on written language, language testing (and the use of corpora in this area) and discourse. We’ve published a number of research papers in these areas and have listed some of these below. We’ve indicated which ones are open-access. 2. The focus in your book is on grammar could you give us a quick (or not so quick) description of how you define grammar in your book? We could start by saying what grammar isn’t. It isn’t a set of prescriptive rules or the opinion of a self-appointed expert, which is what the popular press tend to bang on about when they consider grammar! Such approaches are inadequate in the definition of grammar and are frequently contradictory and unhelpful (we discuss some of these shortcomings in the book). Grammar is defined in our book as being (a) descriptive rather than prescriptive (b) the analysis of form and function (c) linked at different levels (d) different in spoken and written contexts (e) a system which operates in contexts to make meaning (f) difficult to separate from vocabulary (g) open to choice. The use of corpora has revolutionised the ways in which we are now able to explore language and grammar and provides opportunities to explore different modes of text (spoken or written) and different types of text. Any description of grammar must take these into account and part of what we wanted to do was to give readers the tools to carry out their own research into language. When someone is looking at a corpus of a particular type of text, they need to keep in mind the communicative purpose of the text and how the grammar is used to achieve this. For example, a written text might have a number of complex sentences containing both main and subordinate clauses. It may do so in order to develop an argument but it can also be more complex because the expectation is that a reader has time to process the text, even though it is dense, unlike in spoken language. If we look at a corpus we can discover if there is a general tendency to use a particular pattern such as complex sentences across a number of texts and how it functions within these texts. 3. What corpora do you use in the book? We have only used open-access corpora in the book including BYU-BNC, COCA, GloWbe, the Hong Kong Corpus of Spoken English. The reason for using open-access corpora was to enable readers to carry out their own examinations of grammar. We really want the book to be a tool for research. 4. Do you have any opinions on the public availability of corpora and whether wider access is something to push for? Short answer: yes. Longer answer: We would say it’s essential for the development of good language teaching courses, materials and assessments as well as democratising the area of language research. To be fair to many of the big corpora, some like the BNC have allowed limited access for a long time. 5. The book is aimed at research so what can Language Teachers get out of it? By using the book teachers can undertake small-scale investigations into a piece of language they are about to teach even if it is as simple as finding out which of two forms is the more frequent. We’ve all had situations in our teaching where we’ve come across a particular piece of language and wondered if a form is as frequent as it is made to appear in a text-book, or had a student come up and say ‘can I say X in this text’ and struggled with the answer. Corpora can help us with such questions. We hope the book might make teachers think again about what grammar is and what it is for. For example, when we consider three forms of marry (marry, marries and married) we find that married is the most common form in both the BYU-BNC newspaper corpus and the COCA spoken corpus. But in the written corpus, the most common pattern is in non-defining relative clauses (Mark, who is married with two children, has been working for two years…). In the spoken corpus, the most common pattern is going to get married e.g. When are they going to get married? We think that this shows that separating vocabulary and grammar is not always helpful because if a word is presented without its common grammatical patterns then students are left trying to fit the word into a structure and in fact words are patterned in particular ways. In the case of teachers, there is no reason why an initially small piece of research couldn’t become larger and ultimately a publication, so we hope the book will inspire teachers to become interested in investigating language. One of the things that got us interested in writing the book was the need for a book pitched at undergraduate students in their final year of their programme and those starting an MA, CELTA or DELTA programme who may not have had much exposure to corpus linguistics previously. We wanted to provide tools and examples to help these readers carry out their own investigations. Jones, C., & Waller, D. (2015). Corpus Linguistics for Grammar: A guide for Research. London: Routledge. Jones, C. (2015). In defence of teaching and acquiring formulaic sequences. ELT Journal, 69 (3), pp 319-322. Jones, C, Waller, D., & Golebiewska, P. (2013). Defining successful spoken language at B2 Level: Findings from a corpus of learner test data. European Journal of Applied Linguistics and TEFL, 2(2), pp.29–45. 2015 seems to be turning into a good year for corpus linguistics books on teaching and learning, you may have read about Ivor Timmis’s Corpus Linguistics for ELT: Research & Practice. 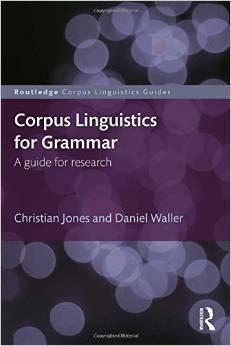 There is also a book by Christian Jones and Daniel Waller called Corpus Linguistics for Grammar: A guide for research. This post is an interview with James Thomas, ‏@versatilepub, on Discovering English with SketchEngine. 1. Can you tell us a bit about you background? 2. Who is your audience for the book? 3. Can your book be used without Sketch Engine? 4. How do you envision people using your book? 5. Do you recommend any other similar books? Currently I’m head of teacher training in the Department of English and American Studies, Faculty of Arts, Masaryk University, Czech Republic. In addition to standard teacher training courses, I am active in e-learning, corpus work and ICT for ELT. In 2010 my co-author and I were awarded the ELTon for innovation in ELT publishing for our book, Global Issues in ELT. I am secretary of the Corpora SIG of EUROCALL, and a committee member of the biennial conference, TALC (Teaching and Language Corpora). My work investigates the potential for applying language acquisition and contemporary linguistic findings to the pedagogical use of corpora, and training future teachers to include corpus findings in their lesson preparation and directly with students. Teacher trainees – the digital natives – whether they are doing degree courses or CELTA TESOL Trinity courses. People doing any guise of applied linguistics that involve corpora. Students and aficionados of linguistics. Advanced students of English who want to become independent learners. No. (the answer to the next question explains why not). Like any book it can be read cover to cover, or aspects of language and linguistics can be found via the indices: (1) Index of names and notions, (2) Lexical focus index. It is pretty essential that the reader has Sketch Engine open most of the time. Apart from some discussions of features of linguistic and English, the book primarily consists of 342 language questions/tasks which are followed by instructions – how to derive the data from the corpus recommended for the specific task, and then how to use Sketch Engine tools to process the data, so that the answer is clear. to be positive, would it not? guess with make a guess, smile with give a smile? In Pride and Prejudice, are the Darcies ever referred to with their first names? There is an accompanying website with a glossary – a work eternally in progress, and a page with all the links which appear in the footnotes (142 of them), and another page with the list of questions, which a user might copy and paste into their own document so that they can make notes under them. The 223 page book has three interwoven training goals, the upper level being SKE’s interface and tools, the second being a mix of language and linguistics, while the third is training in deriving answers to pre-set questions from data. AFAIK, there is nothing like this. In all the conference presentations and papers and articles that I have seen and heard over the years in connection with using corpora in ELT, with very few exceptions teachers and researchers focus on a very narrow range of language questions. When my own teacher trainees use corpora to discover features of English in the ways of DESKE, they realise that the steep learning curve is worth it. They are being equipped with a skill for life. It is a professional’s tool. Sketch Engine consists of both data and software. Both are being constantly updated, which argues well for print-on-demand. It’ll be much easier to bring out updated versions of DESKE than through standard commercial publishers. I’m also expecting feedback from readers, which can also be incorporated into new editions. My interests in self-publishing are partly related to my interest in ICT. This book is printed through the print-on-demand service, Lulu.com. One of the beauties of such a mode of publishing is the relative ease with which the book can be updated as the incremental changes in the software go online. This is in sharp contrast to the economies of scale that dictate large print runs to commercial publishers and the standard five-year interval between editions. There is a new free student-friendly interface which has its own corpus and interface, known as SKELL which has been available for less than a year. It is also undergoing development at the moment, and I will be preparing a book of worksheets for learners and their teachers (or the other way round). I see it as a 21st cent. replacement of the much missed “COBUILD Corpus Sampler”. Lastly, I must express my gratitude to Adam Kilgarriff, who owned Sketch Engine until his death from cancer on May 16th, at the age of 55. He was a brilliant linguist, teacher and presenter. He bought 250 copies of my book over a year before it was finished, which freed me up from other obligations – a typical gesture of a wonderful man, greatly missed. Many thanks to James for taking the time to be interviewed but pity my poor wallet with some very neat CL books to purchase this year. James also mentioned that, for a second edition file, Chapter 1 will be re-written to be able to use the open corpora in SketchEngine. I was using a press release text from the company of a student recently. He was drawn immediately to two items – We raise the bar every year to remain contemporary; the high standards that we hold ourselves to in our people practices. We did a bit of work on the use of these two items in the text. After the session I was thinking that it would have been good for the student to have been able to see other examples of use of the language he had pointed out. That is although the language in the press release was authentic to what extent was it typical and so possibly worth learning by the student? 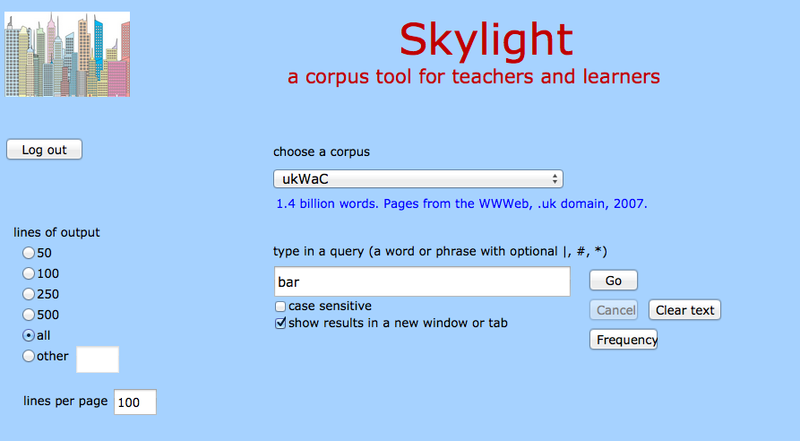 Skylight offers a sub-query search feature which allows one to see collocating words that can appear with several intervening words and in any position. For example does the phrase raise the bar always appear in this form or are there other versions? The results show that yes raise the bar is most common form, there are some uses (which can be found through the sort feature) where an adjective such as quality or performance is placed in-between. i.e. “raise the quality bar”; “raise the performance bar”. An interesting use is with “a film that manages to raise an emotional bar”. As to what extent a student like mine who was interested in human resources/training issues would be as interested in such sentences is worth asking and exploring. Since the ukWaC corpus samples general web texts we can assume some example uses would interest our learner. The key import is that this method allows a way to quickly extend a text without relying on one’s wits in the class.